Understanding Pregnancy Basics Could Make Childbirth Safer : Shots - Health News Remarkably little is known about the fundamentals of how a woman carries a baby inside her. 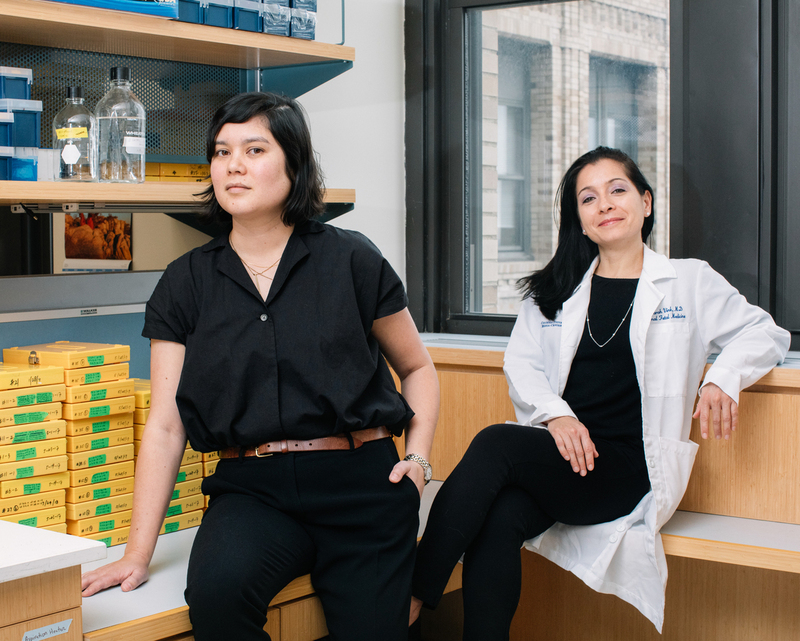 Two Columbia University researchers aim to change that, to reduce the number of kids born too soon. "I went to the mirror and I talked to Iris," Crystal says. "I said, 'you know, this was a rough day. ... You're going to have them. But then the next day comes and the sun comes up and we move forward.' "
"I think I knew before I opened my eyes that she had died," Crystal says, her voice cracking as she reaches for a tissue. Afterward, as she was recovering in the hospital and mourning the loss of Iris, Crystal and her family asked a lot of questions. Why can't you seal up the amniotic sac if your water breaks early? Why can't you reliably stop preterm labor? "And that's when Dr. Vink told us that, you know, rare diseases are being cured in this day and age, but we don't know what triggers full-term labor," Crystal recalls. "That just collectively blew away everyone in the room." It was surprising but true. When it comes to pregnancy, research on some basic questions stalled decades ago, Vink says. If a pregnancy is normal, that doesn't matter much. But when things go wrong, those gaps in knowledge become issues of life and death. "It's mind-boggling that in this day and age, we still don't understand [even] in a normal pregnancy how women go into labor — what triggers labor," Vink says. "Because we don't understand the normal fundamental mechanisms, we can't identify how things go bad — and then how we fix it when things go bad." Crystal, for example, had undergone a procedure called cervical cerclage: Vink had stitched Crystal's cervix closed in hopes of preventing it from opening too soon. The technique has been around for more than 40 years, and it's about the only treatment available for what doctors call "an incompetent cervix." But much of the time, it's not enough to stop a premature birth. Most basic knowledge about pregnancy comes from research performed in the 1940s, Vink says, and she's working hard to update that information. She's focused first on the cervix, she says, because if doctors can get the cervix to stay closed in those final, crucial weeks of gestation, the baby won't be born too soon, even if the amniotic sac breaks. "So, what is the cervix made out of? What proteins are there, what cells are there? How are all these things interacting? How do they change in pregnancy?" she asks, laying out some of the unknowns. By the end of pregnancy, a woman's cervix goes from being stiff, like the tip of a nose, to very soft. But how? One of her first findings, she says, is that the cervix is not made mostly of collagen, as doctors long thought. It also has a lot of muscle, especially near the very top. "I'm kind of an oddball in the department of obstetrics and gynecology," Myers says. "I teach mechanics classes and design classes here at Columbia." "So if you take rubber and you heat it up and you pull on it, it gets really, really soft — and then it breaks," Myers says. "It's an important area — an understudied area — and a basic part of pregnancy physiology," says Dr. Michael House, an OB-GYN at Tufts Medical Center who also has a background in engineering. "There is just lots to learn." House has been a mentor to Myers and continues to collaborate with her. He says the focus on the cervix is particularly important, "because a cervix problem can affect the pregnancy very early." Myers is investigating several aspects of the biomechanics of pregnancy — from how much the uterus can stretch, to how much pressure pregnancy exerts on the cervix, to how much force a baby's kick puts on the whole system. "We're building computational models of female pregnancy to answer those questions," Myers says. She has two labs at Columbia — one at the hospital and one in the engineering school. In the lab at the engineering school there are a variety of microscopes and scalpels and slides. 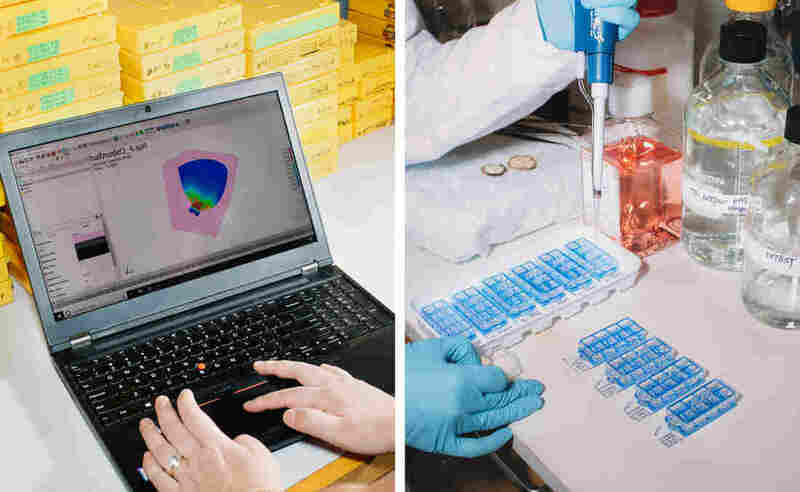 There's one machine that can inflate the uterine membranes like a balloon, and another, about the size of a microwave, that stretches uterine tissue between two grips. "These [are] types of machines you'll see in all different kinds of material testing labs," Myers explains. "In civil engineering you can have one of these machines that is like two or three stories high and they're testing the mechanical strength of, [say], railroad ties." "We've mechanically tested various pregnant tissues and nonpregnant tissues of the cervix," Myers says, "and its stiffness changes by three orders of magnitude." 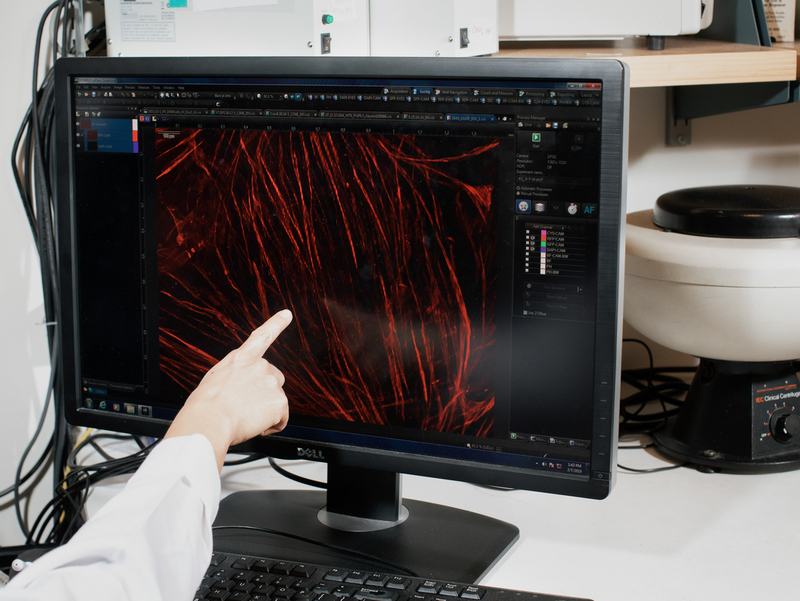 Vink reviews images of smooth muscle cells that her team isolated from cervical biopsies taken from pregnant women at different stages of pregnancy. The stiffness of the cervix changes by "three orders of magnitude" across nine months, Myer has found. All those measurements go into a databank. And when women in Vink's practice get an ultrasound, the technicians spend an extra few minutes measuring the mother's anatomy, as well as the baby's, and send that information to Myers, too. Their goal is to be able to examine a pregnant woman early on, and accurately predict whether she will go into labor too soon. It's a first step, Vink hopes, toward better interventions to stop that labor. That's what Brittney Crystal is aiming for as well. After baby Iris died, Crystal started a foundation called The Iris Fund, which has raised more than $150,000 for Vink's and Myers' research. "She didn't get to have a life," Crystal says. "But we really want her to have a very strong legacy."